Part 1 Principles of industrial enzyme technology: Discovering new industrial enzymes for food applications; Improving enzyme performance in food applications; Industrial enzyme production for food applications; Immobilized enzyme technology for food applications; Consumer attitudes towards novel enzyme technologies in food processing. Part 2 Novel enzyme technology for food applications: Using cross-linking enzymes to improve textural and other properties of food; Enzymatically-modified whey protein and other protein-based fat replacers; Enzymatic production of bioactive peptides from milk and whey proteins; Production of flavours, flavour enhancers and other protein-based speciality products; Applications of cold adapted proteases in the food industry; Health-functional carbohydrates: Properties and enzymatic manufacture; Flavourings and other value added products from sucrose; Production of novel lipids with functional health benefits; The selectivity of lipases: Harvesting of fatty acids and preparation of structured lipids. The food industry is constantly seeking advanced technologies to meet consumer demand for nutritionally balanced food products. Enzymes are a useful biotechnological processing tool whose action can be controlled in the food matrix to produce higher quality products. 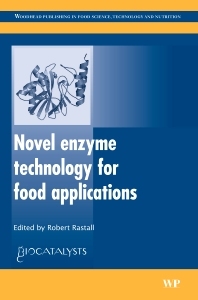 Written by an international team of contributors, Novel enzyme technology for food applications reviews the latest advanced methods to develop specific enzymes and their applications. Part one discusses fundamental aspects of industrial enzyme technology. Chapters cover the discovery, improvement and production of enzymes as well as consumer attitudes towards the technology. Chapters in Part two discuss enzyme technology for specific food applications such as textural improvement, protein-based fat replacers, flavour enhancers, and health-functional carbohydrates. Novel enzyme technology for food applications is a standard reference for all those in industry and academia concerned with improving food products with this advanced technology. Professor Robert Rastall holds a senior post at the University of Reading. Professor Rastall is widely published and is highly regarded for his research activities principally in the field of carbohydrate bioengineering.